A widespread, but apparently very rare and poorly known species. It is quite likely threatened by overgrazing and habitat loss to agriculture, but too little is known about its population size and trends, and therefore its risk of extinction cannot be assessed at present. Dry stony flats and slopes with clay soils. Plants are heavily browsed by game and livestock, and may have disappeared in some parts of its range due to overgrazing (J.H. Vlok pers. comm. 2016). In the Overberg it is likely to have declined due to habitat loss to crop cultivation. Pteronia oppositifolia is a widespread, but very poorly known species. There are only four collections of it in SANBI herbaria, and three of these are more than 100 years old. Small, scattered subpopulations are known to occur in the Anysberg Nature Reserve near Ladismith in the Little Karoo (J.H. Vlok pers. comm. 2016), and it was recently observed in a small renosterveld fragment near Swellendam in the Overberg. The reason for the lack of records is not understood, but there are two possible explanations. 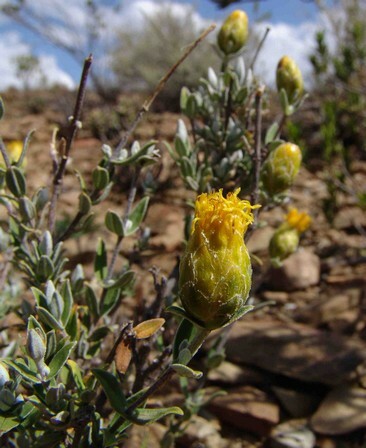 Plants are highly palatable, and in many parts of the Little Karoo heavy overgrazing has reduced many shrubs to unrecognisable stumps, and such plants very rarely flower, which makes them easy to overlook and very difficult to identify (J.H. Vlok pers. comm. 2016). Secondly, Pteronia is in need of taxonomic revision, and Pteronia oppositifolia may be part of an unresolved species complex, and therefore possibly misidentified as other taxa (A.R. Magee pers. comm. 2016). Hutchinson, J. and Phillips, E.P. 1917. A revision of the genus Pteronia (Compositae). Annals of the South African Museum 9:277-329.